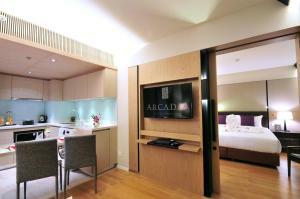 Arcadia Suites Ploenchit Sukhumvit by Compass Hospitality is a 7-minute walk from Ploenchit BTS Skytrain Station. It offers spacious suites with a kitchenette and a washing machine. It boasts an outdoor pool, a fitness centre and free WiFi, which is available throughout the property. The hotel is a 10-minute drive to Central Chidlom Department Store. It is a 45-minute drive from Suvanarbhumi Airport. Guests enjoy free Tuk-Tuk shuttle service to Ploenchit BTS Skytrain Station. Furnished with modern décor, rooms at Arcadia Suites Ploenchit Sukhumvit features a separate living area, flat-screen satellite TVs and dining area. An en suite bathroom comes with a bathtub and separate shower cubicle. Luggage storage and laundry service can be arranged at the 24-hour front desk. For guests’ convenience, the hotel also provides shuttle service, as well as concierge service. Guests can enjoy a variety of international dishes at the restaurant from 06:00-22:30. Room service is available upon request. Guests are required to present a photo identification and the same credit card used to guarantee the booking when checking in at the hotel. The name of the credit card holder must be the same as the guest's name. If the guest fails to provide the credit card, the hotel shall have the right to request for an alternative payment method. Please inform Arcadia Suites Ploenchit Sukhumvit by Compass Hospitality in advance of your expected arrival time. You can use the Special Requests box when booking, or contact the property directly with the contact details provided in your confirmation. Guests are required to show a photo identification and credit card upon check-in. Please note that all Special Requests are subject to availability and additional charges may apply. Room features a kitchenette, separate living area and a washing machine. It comes with 2 flat-screen satellite TVs, a DVD player and dining area. An en suite bathroom comes with a bathtub and separate shower cubicle. Rate: THB 2429.10 ... THB 8999.00; select dates below to get current rates. 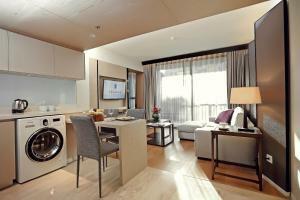 Larger than Superior Suite, room features a kitchenette, separate living area and a washing machine. It comes with 2 flat-screen satellite TVs, a DVD player and dining area. An en suite bathroom comes with a bathtub and separate shower cubicle. 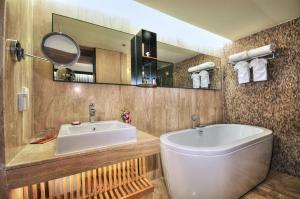 Offering more space than Deluxe Suite, room features a kitchenette, separate living area and a washing machine. It comes with 2 flat-screen satellite TVs, a DVD player and dining area. An en suite bathroom comes with a bathtub and separate shower cubicle. Spacious suite features 2 bedrooms, a kitchenette with dining area and separate living area. It has 3 flat-screen satellite TVs, a DVD player and a washing machine. An en suite bathroom comes with a bathtub and separate shower cubicle. This suite has a bathrobe, washing machine and microwave. Featuring one double bed and a rollaway bed, this triple room has a bathrobe, minibar and sofa. This suite features a DVD player, seating area and sofa.